The speeding and overtaking common among bus drivers in the city and suburbs could be due to betel chewing, a medical researcher revealed. It has been found that drivers and bus conductors chew betel to stay awake and concentrate on driving. 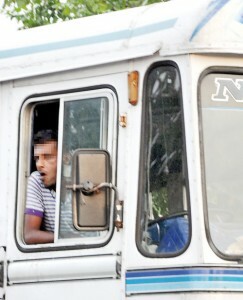 The survey conducted by the Institute of Oral Health, (IOH) Maharagama, on 103 bus drivers and conductors in the High Level Road in the Maharagama and Dehiwala areas revealed that more than 80 per cent of them chew betel to keep themselves awake and focus on the job. Another survey carried out jointly by the University of Jaffna’s Faculty of Medicine, the Department of Community Medicine and the Office of the Regional Director of Health in Jaffna revealed that 70.4 per cent of the conductors and drivers surveyed chewed betel while driving. IOH Head of Research, Dr. Hemantha Amarasinghe, said the nicotine in the tobacco that is taken along with the betel produces a “high”. The combination of betel, arecanut and slaked lime along with a 2cm- strip of tobacco in the mouth excites chewers, producing a feeling of euphoria. He said the tobacco in the quid has nicotine that excites the central nervous system that in turn increases the heartbeat, inducing the “high” feeling. Dr. Amarasinghe said that under the Tobacco and Alcohol Act of 2006 it is an offence to drive under the influence of drugs and that betel-chewing should be prohibited for drivers. Betel chewing is said to be the fourth most common psychoactive substance taken in the world, only after to caffeine, nicotine and alcohol. The habit of chewing betel is socially accepted in South and South East Asian region and is prevalent among women and children in India, Pakistan, Bangladesh, Thailand, Indonesia and Sri Lanka. The age-old habit is so widespread that enterpreneurs have moved in to cash in on the industry, marketing non-perishable forms of betel quids (without the betel leaf) that are bringing in hundreds of millions of dollars in profit. The quids are sold as beeda or babul in satchets, compact boxes and metal tins. Here, the arecanut has been spiced with cloves, cardamom, nutmeg, aniseed, coconut, fruit extracts and other spices. The arecanut used in the quid is said to be harmful to oral health. Research has found that arecanut consumed in any form is harmful to health and the commercially produced form even riskier. The IOH survey revealed that the betel-chewing habit not only puts commuters at risk but also places the drivers’ health in jeopardy, with the risk of developing oral cancer. 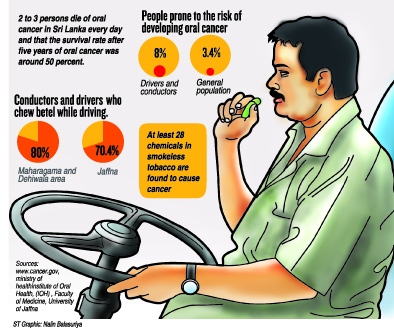 Eight per cent of the drivers and conductors are prone to oral cancer due to prolonged chewing, the survey says. According to a national survey done by the ministry of health in 2002, oral cancer among the general population is around 3.4 per cent. The two-month survey showed that betel chewers had abnormalities in their oral mucosa due to the habit. This included oral sub mucous fibrosis, frictional keratosis and lichen planus. Lamentably, nearly 50 per cent of of betel chewers had minimum knowledge of the harmful effects of betel on their health and an equal number were unaware of the treatments available for oral cancer, to seek early treatment. There has been little improvement from the awareness programs being carried out jointly by the Health Ministry’s National Cancer Control Programme and the National Transport Commission since 2012. Around 35,000 stickers printed in Sinhala and Tamil were posted in buses and other public places calling on the public to stop smoking and desist from chewing betel quid, beeda and babul. Feedback a year later (2013) revealed there was only a slight change in perception among the bus drivers and conductors about betel and arecanut chewing. Among 481 participants in the survey 19 people said that they had realised that betel chewing could harm them. “This is not enough: we need to continue with our activities to create greater awareness,” Dr. Amarasinghe said. The National Cancer Control Programme has also initiated an anti-betel chewing programme jointly with religious leaders. The National Cancer Control Programme will next week begin a national oral health survey that dental experts say could reveal an escalation of tooth decay and other problems. The programme, to begin on May 26, will target 100 clusters of 100 persons each from various provinces, within the age groups of five, 12, 15, 35-44 and those over 65 to assess oral health patterns among Sri Lankans. The last programme, conducted in 2003, showed that nearly 90 per cent of adults between the ages of 35 and 44 had dental caries (tooth decay) while only 9.7 per cent had healthy gums. Of children below the age of five years, 65 per cent showed signs of tooth decay with only 23.3 per cent displaying healthy gums. Dr Hemantha Amarasinghe of the Institute of Oral Health in Maharagama said the problem could have worsened within the last 10 years because of changing food habits, over-consumption of sweets and not brushing teeth properly. “Everybody should brush at least twice a day and use toothpaste containing fluoride,” he said. He said that along with the survey, the public would also be educated on the importance of maintaining oral health and prevention methods on dental caries and other oral diseases.